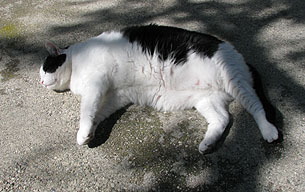 Today is rolling around in the sun day. 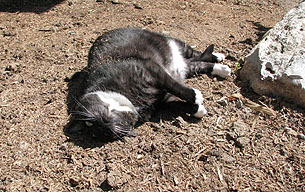 On the left, Domino is rolling around in the wood-chippy dirt where the Jacaranda used to be, getting herself filthy beyond belief in the process. But she sure enjoyed herself. On the right, Inkblot prefers the cleaner approach of rolling around on the patio instead. Either way, it’s highly recommended therapy. Weather permitting, you should try rolling around in the spring air yourself this weekend. It can’t hurt, and it might help.